Traditionally a white specialty, several Magic spells add to your life total. Not only does this buff your health and let you absorb more punishment before losing, it combos with several abilities that reward lifegain tactics. 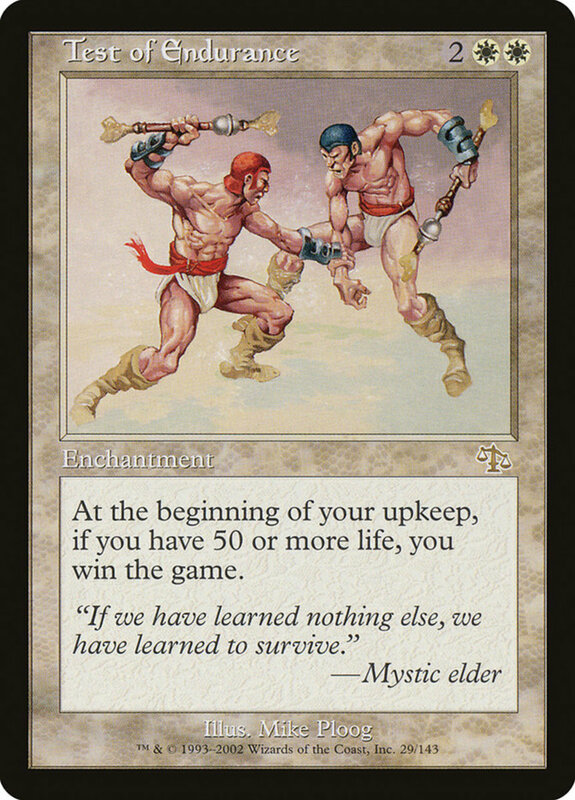 Some cards strengthen when you actually gain life; others activate bonus effects while your life total meets a certain threshold. We'll see instances of both as we review the ten best life-empowered spells in Magic: The Gathering! 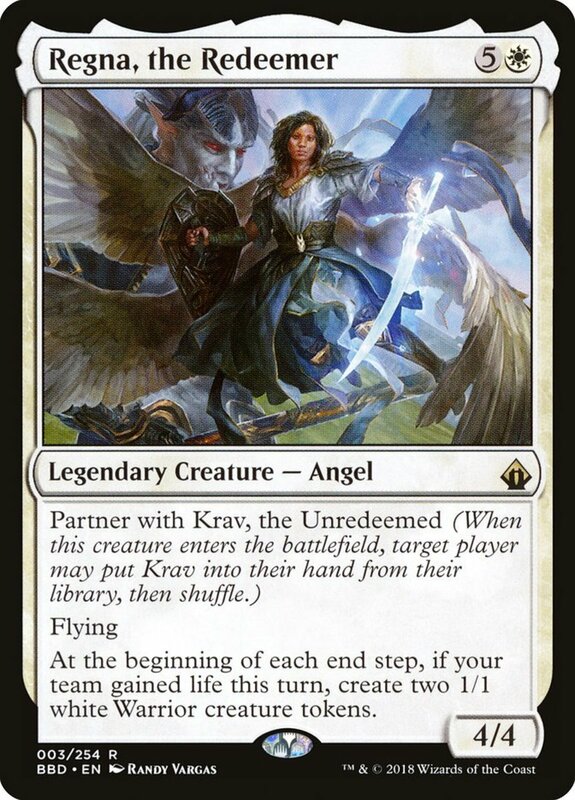 One half of a paired-partner set, angelic Regna lets you search out her demon ally "Krav, the Unredeemed" when you cast her (and vice versa), helpfully replenishing your hand. 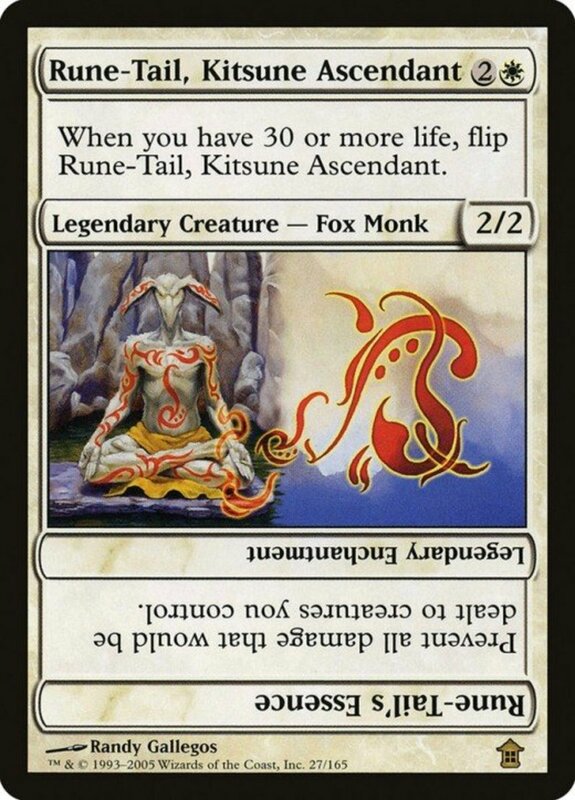 And while she's slightly weak for her cost at 4/4, she enjoys flying and creates two 1/1 tokens at the end of any turn (even an opponent's) where you gained life. This impresses even on its own, but is particularly helpful alongside Krav, who can sacrifice creatures to gain life and draw cards. Use Regna's weak tokens as fodder for this self-repeating cycle. 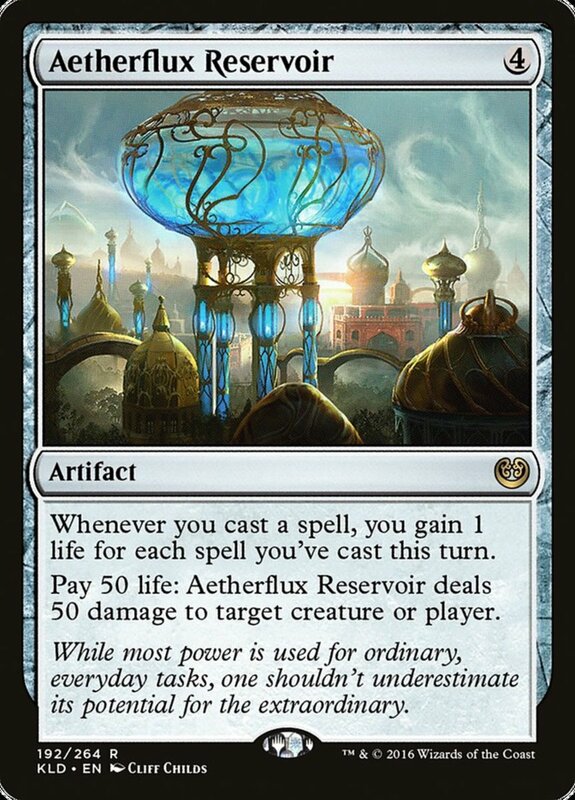 As a colorless artifact, Reservoir fits snugly in any deck, and whenever you cast a spell, it gains you one life for each spell you've cast that turn. A nice benefit, but the real treat is Reservoir's game-ending effect, letting you pay 50 life at instant speed to deal a whopping 50 damage to any target. You'll probably be on your last legs after activating the effect, but in 1v1 it shouldn't matter, as you'll likely have just won the game. As a bonus, note Reservoir isn't sacrificed when you trigger the effect, giving you a chance to recover if your foe somehow survives or if you're playing multiplayer. These spells are five-cost enchantments that are powerful on their own and lethal in tangent. 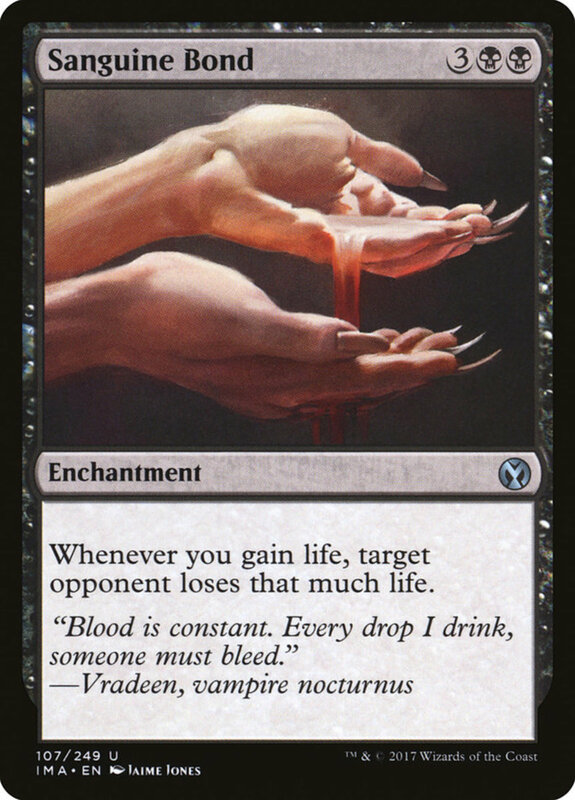 Whenever you gain life, Sanguine Bond has an opponent lose that much health; whenever an opponent loses health, Exquisite Blood gains you that much life. Once they're both out, all you need is to either gain life or inflict damage and your enchantments will repeatedly trigger until your foe's health is completely sapped, offering one of the easiest infinite combos in the game. Use black searches like "Vampiric Tutor" to quickly pull these aces from your library. 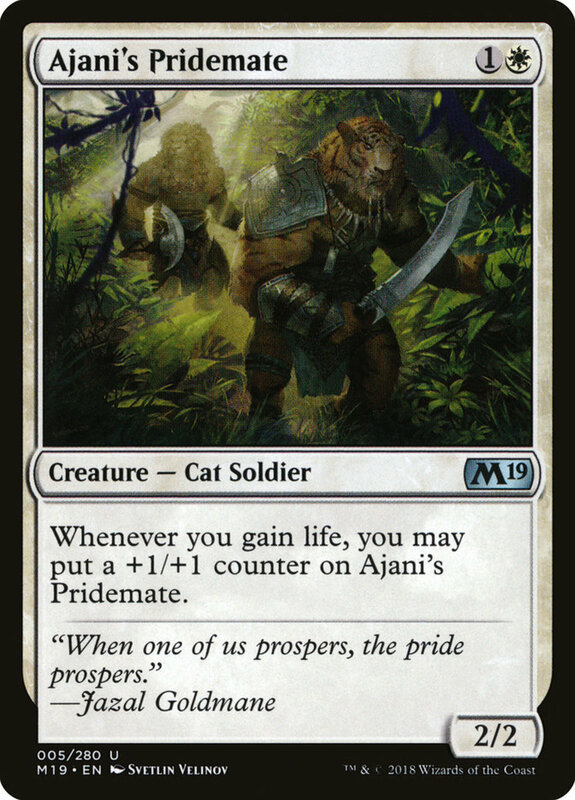 For just two mana (one of which can be any color), Pridemate offers a 2/2 with cat and soldier synergies, already a fair bargain. But he really excels with his effect, amassing a +1/+1 counter whenever you gain life. Left unchecked, Pridemate's stats can reach double digits, pressuring rivals to "waste" a removal on a low-cost troop. 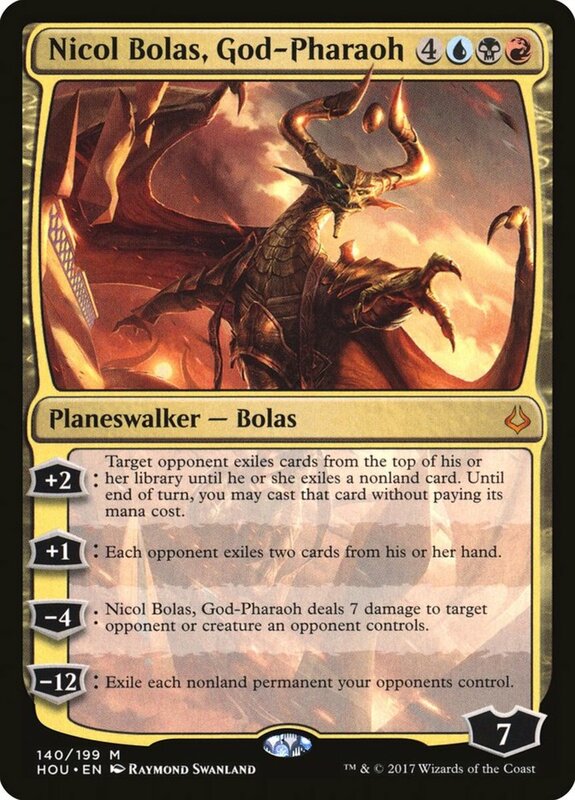 Try placing trample on him with cards like "Rancor" or "Nylea, God of the Hunt" to ensure his massive stats pierce through blockers. 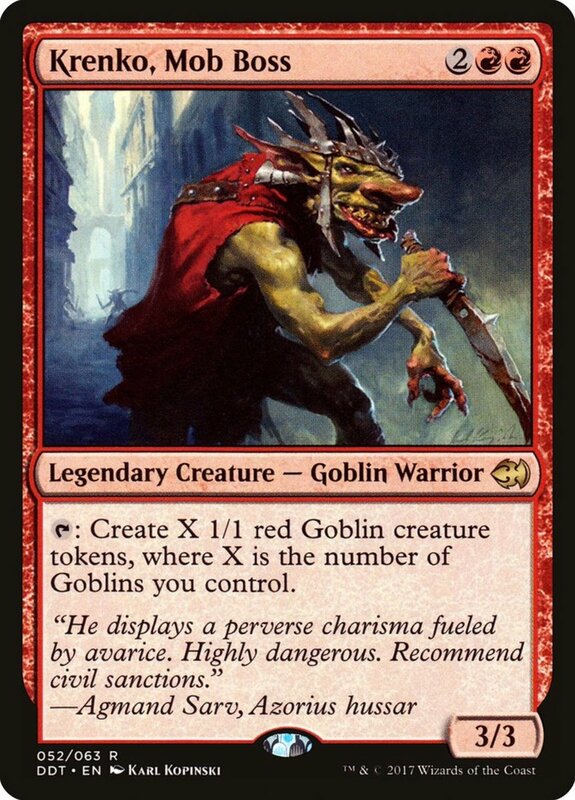 A prime threat in my own commander decks and the online MTG Arena game, Pridemate's proven a staunch ally in numerous playstyles, and he's much cheaper than most of today's units, costing less than a single dollar! 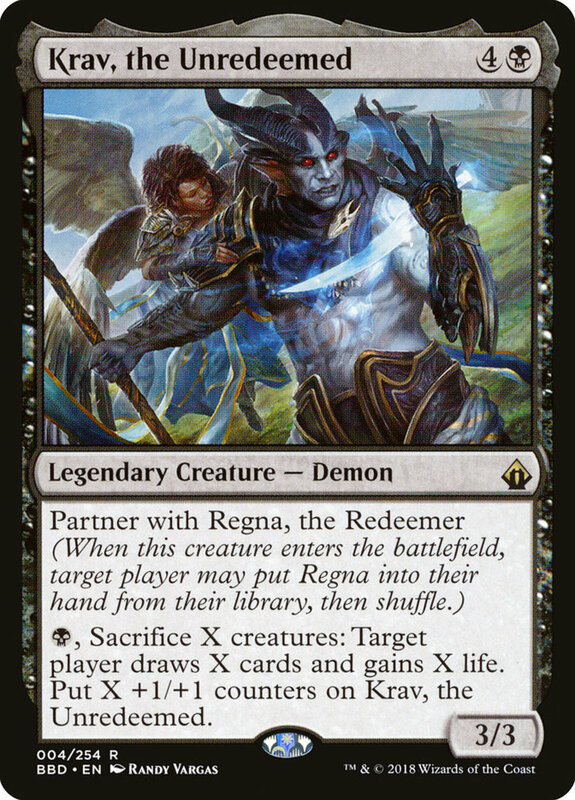 Pride specifically needs black/white mana but accepts any combination, and his symbols help meet devotion costs on spells like "Athreos, God of Passage." 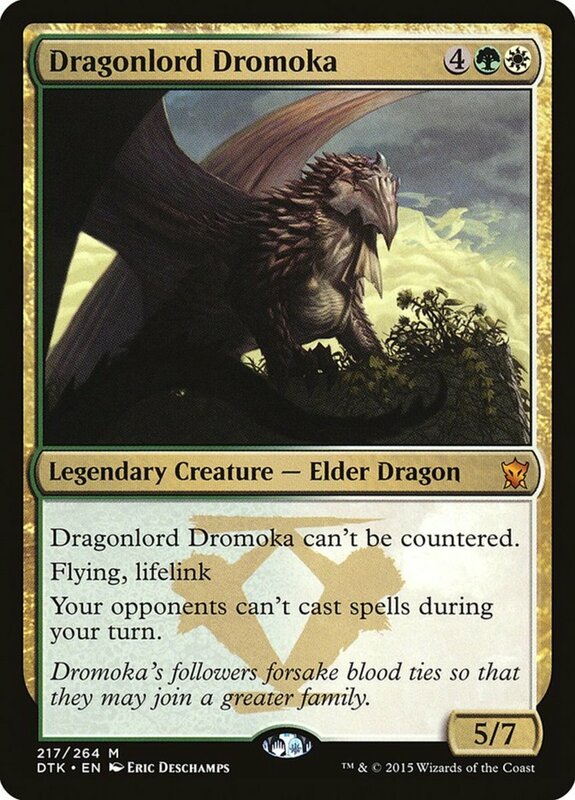 More than that, he's a 4/4 troop with both flying and lifelink, recovering health whenever he lands damage. 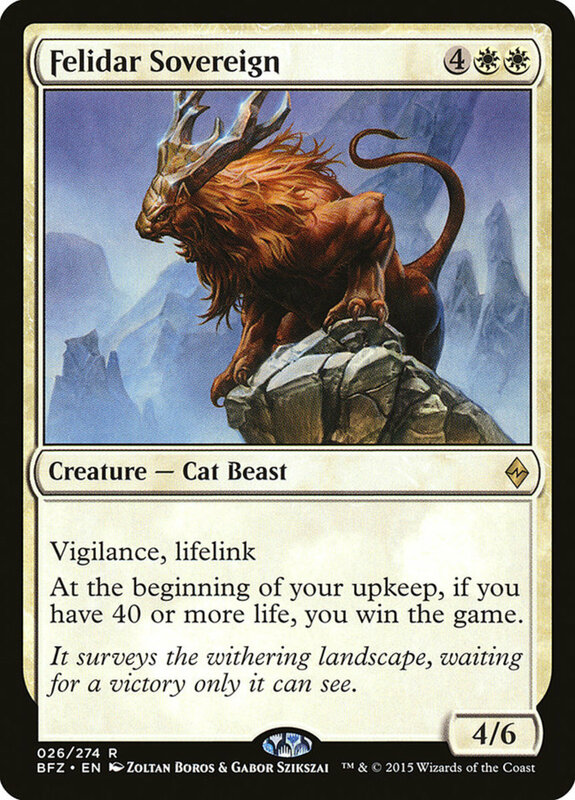 Stopping there, you'd have a good card, but Pride goes above and beyond by gaining +4/+4 as long as you have at least 25 life. In standard formats, you'd have to boost your starting life to meet the condition, but with commander's opening 40 life, you begin play with almost twice as much health as you need; in most cases, Pride arrives as a monstrous 8/8. Without a removal, foes will soon fall to his aerial assault. 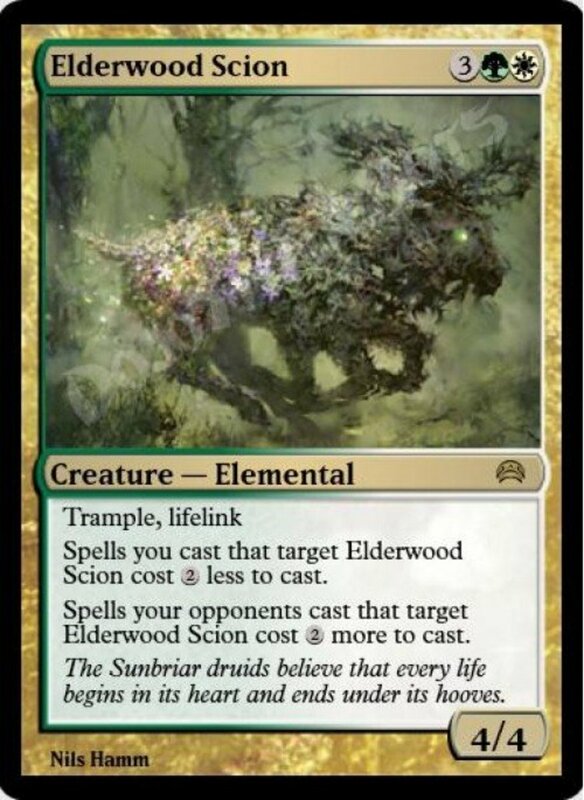 Speaking of harnessing commander's mechanics, this enchantment triggers at the start of your upkeep if you have at least 50 life. Even in EDH, you'll need to buff your beginning value, but Test is worth the effort—it immediately wins the game when activated. 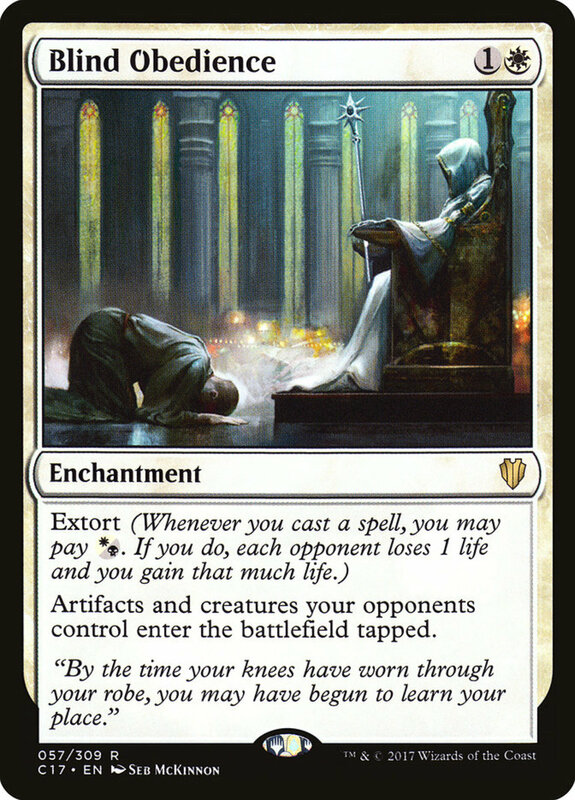 With commanders like "Oloro, Ageless Ascetic" and early life-gaining spells such as "Fountain of Renewal," you'll meet the threshold before you know it, giving foes a single turn to remove your enchantment lest they immediately lose the match. Similarly to Pridemate, legendary Karlov arrives as a 2/2 warrior for two mana, but now you'll specifically need one white and one black mana. To reward your efforts, he'll gain not one but two +1/+1 counters whenever you gain life, quickly skyrocketing in power. 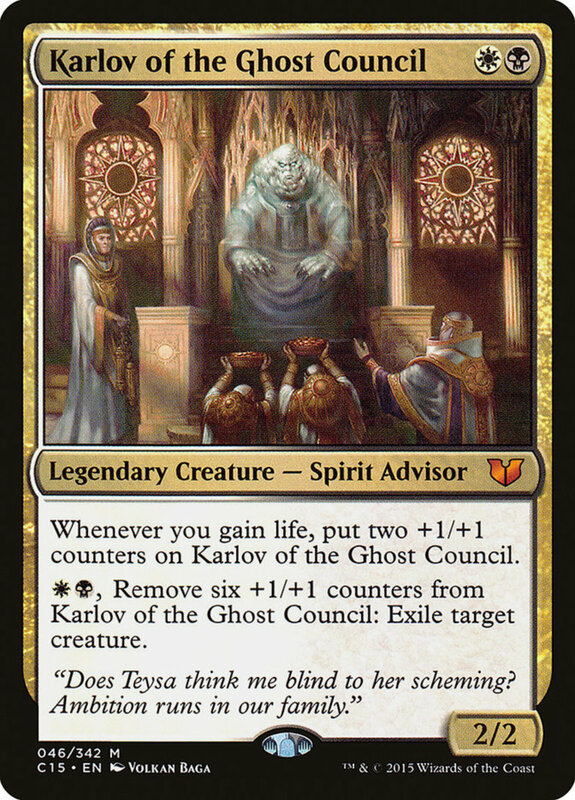 As if that weren't enough, you can spend two mana and remove six of Karlov's counters to instantly exile an opposing creature, a fast and reusable removal on top of an excellent beatstick. Whether leading your army as commander or supporting another general, Karlov's not to be trifled with. One of the best rotating cards in the game, Rune-Tail offers another easy way to exploit commander's higher life. He starts as a weak 2/2 but flips to his Essence enchantment when you have 30 or more health—often an immediate change in commander. Once transformed, Rune-Tail won't rotate back even if your life decreases, and he shields your creatures from all damage they would suffer! This makes attacking and blocking a breeze, and note the effect even guards against effect damage. It won't stop black insta-kills like "Doom Blade," but it's still a formidable and easily-activated army-wide defense. While Sovereign's 4/6 stats are only decent for his hefty cost, he enjoys both vigilance and lifelink, letting him attack without tapping and regaining health on impact. More than that, he essentially provides a more-lenient Test of Endurance, immediately winning the game if you begin your upkeep with at least 40 health! Maintain your starting total, survive a single turn, and victory is yours. And even if your life has dropped below the margin, remember that Sovereign's lifelink can help recover, making it only a matter of time before he'll score the win. A spell that arguably deserves a ban in commander, Ascendant yet again utilizes the format's higher life total. At base, you've got a 1/1 with lifelink, by no means a bad deal. 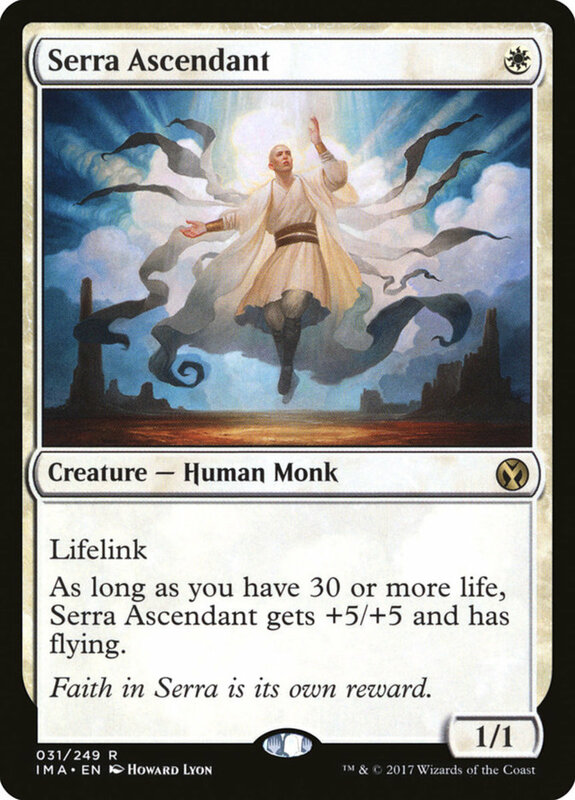 But Ascendant receives +5/+5 and flying as long as you have 30 or more health—easily attained in EDH. 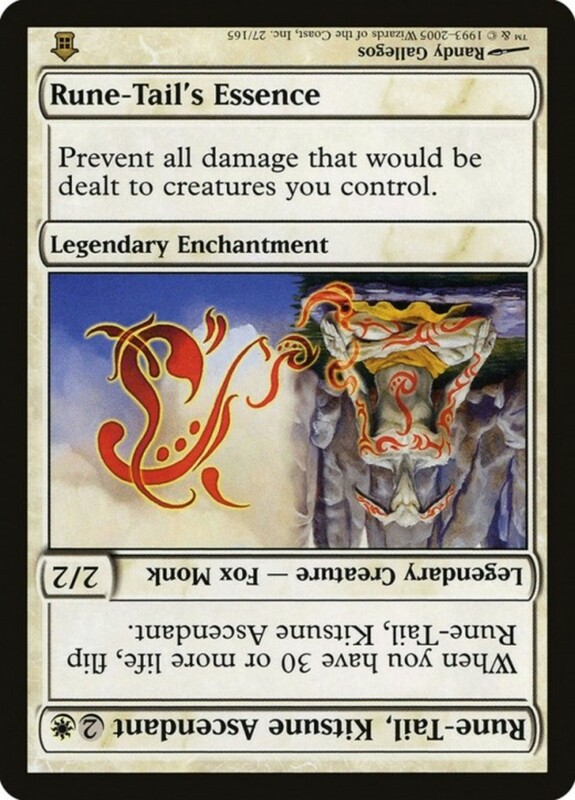 Cast on turn one, and by turn two you're swinging with an aerial 6/6 lifelinked beatstick, far too powerful for early-game defenders to handle. Opponents better have a removal ready, and even if they do, you've forced them to spend a spell on a one-cost unit, leaving them one removal down when your real juggernauts arrive. Today we've seen many black and white spells that reward your health-gaining maneuvers, and the colors unite for the powerful extort ability, seen on aces like "Blind Obedience." 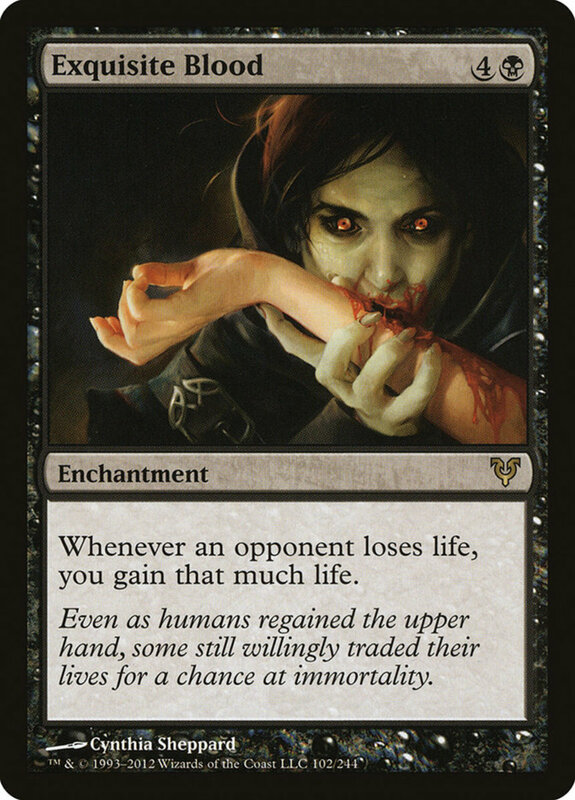 Whenever you cast a spell, extort gives the option of spending an extra black or white mana; if you do, each opponent loses one life, and you gain one. Use this to easily trigger your effects while edging opponents near death, a perfect outlet for excess resources. But for now, as we eagerly await Wizards of the Coast's next expansion of life-boosted spells, vote for your favorite card and I'll see you at our next MTG countdown!